Starship Troopers remake—would you like to know more? 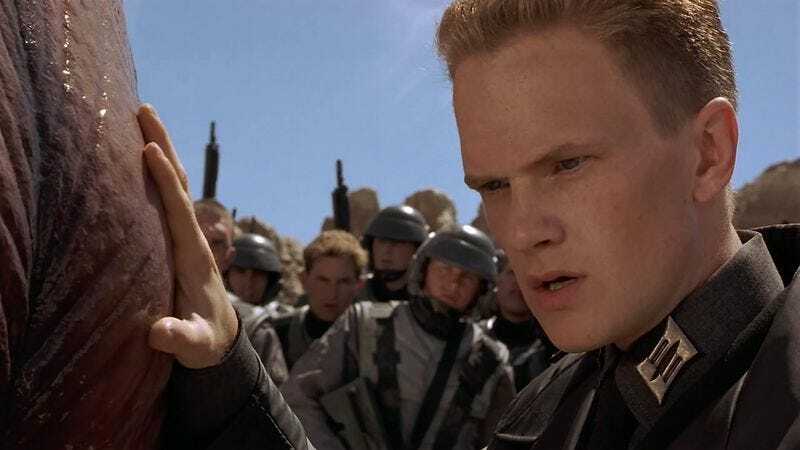 According to a report from Vulture, a remake is now in the works for Starship Troopers, the reboot of the 1997 film now joining remakes of RoboCop and Total Recall that will similarly revive Paul Verhoeven’s sci-fi films without all that embarrassingly dated irony and cutting satire, which are things we used to enjoy before 9/11. Sony is reportedly behind the decision to bring back the subversive, anti-fascist sci-fi film in which the emptiness of war is reflected in the infinite nothing of Denise Richards’ eyes, hiring producer Neal Moritz—responsible for The Fast And The Furious, the aforementioned Total Recall remake, and six or seven other reboots you can find by searching his name on our site—as well as X-Men: First Class screenwriters Ashley Miller and Zack Stentz, whose upcoming projects include both a Top Gun sequel and possibly the movie version of The Fall Guy. Their combined franchise-minded forces hopefully will ensure that nothing of Verhoeven’s polarizing “vision” and “subtext” remain, so we can just get down to the business of killing giant space bugs.